Many employers are using scanning and imaging technology to help collect, store and manage resumes they receive from job seekers. 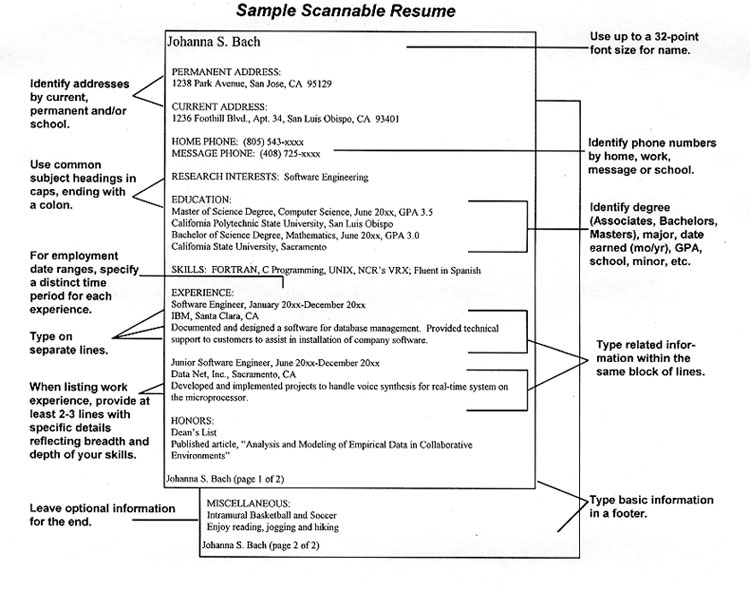 Once received your resume is scanned into an electronic resume database as an image with the aid of OCR (optical character recognition) software. The result is a text file which is read by artificial intelligence for important information such as your name, address, phone number, education, work history, etc. Following are tips for preparing a “scannable” resume that will maximize your chances of being matched with available employment opportunities. Use white or light-colored 8 1/2 x 11 paper, printed on one side only. Do not fold or staple. Use a 10 to 14 point sans-serif font. Do not condense spacing between letters. Use boldface and/or all capital letters for section headings, as long as the letters do not touch one another. Avoid using special characters such as bullets. Avoid fancy treatments such as italics, underline, shadows, borders and reverse (white letters on black background). Avoid vertical and horizontal lines, graphics and boxes. Avoid two-column format or resumes that look like newspapers or newsletters. List each phone number on its own line. Use white space - computers like white space. It recognizes that one topic has ended and another has begun. Left justify the entire document. Use specific, descriptive words to define your skills and experience to maximize your ability to get “hits” (a hit is when one of your skills matches one of the “keywords” the computer has been programmed to find). Include names of software applications you use such as Microsoft Word and Lotus 1-2-3, if appropriate. Use more than one page if necessary (place your name at the top of each page). The computer can easily handle multiple-page resumes. It uses all of the information it extracts from your resume to determine if your skills match available positions. It allows you to provide more information than you would for a human reader. Use jargon and acronyms specific to your industry (spell out the acronyms for human readers). Use common headings such as: Objective, Experience, Employment, Work History, Positions Held, Appointments, Skills, Summary, Summary of Qualifications, Accomplishments, Strengths, Education, Affiliations, Professional Affiliations, Publications, Papers, Licenses, Certifications, Examinations, Honors, Personal, Additional, Miscellaneous, References, etc. When faxing, set the fax to “fine mode” - the recipient will get a better quality copy.